Zendesk Chat has a variety of tools that you can set up to provide optimized live chat support for multiple types of businesses and use cases. Below are some examples and ideas of how triggers, departments, and the chat widget can work for your particular needs. If you have multiple brands or websites you plan to use with Zendesk Chat, the following tips can help you determine how to organize it. Add the Zendesk Chat widget to multiple pages for each of your brands. All the traffic appears in your dashboard, allowing you to manage chat support for each website from one place. Organize agents into departments according to brand. Then, you can set up a trigger to automatically route incoming chats to the correct department based on the visitor's current page. If you'd prefer for visitors to manually select the correct brand, you can also use the Pre-chat form to require visitors to select which department they want to reach out to, and only the agents within that department will receive the chat request. For details, see Using the Pre-Chat form. If you want to only show certain departments to visitors on the Pre-chat form depending on which page they're on, you can do so using the API. For details, see our API documentation. 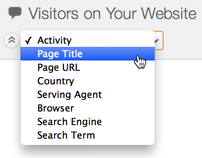 Organize the Visitor List by page title to get an overview of visitors to each of your sites. To learn more, see Exploring the Visitor List. 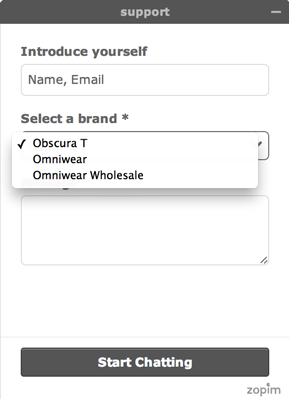 Use the Visitor Page URL field to filter your triggers by brand. For example, you might want to customize your proactive chat messages for each of your brands. For more information, see Working with triggers. 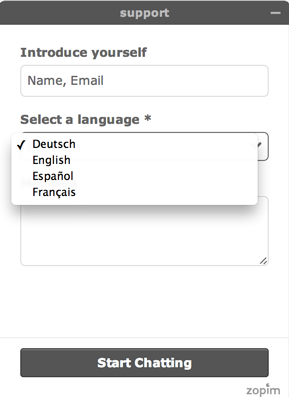 You can set up Zendesk Chat to optimize it for multiple locales or languages. If you organize your agents into departments by language, you can automatically route chats to the correct group of agents according to the visitor's country with a trigger. You can also use departments to group agents by language and use the Pre-chat form to allow visitors to select their language. For details, see Pre-chat form. The Zendesk Chat widget attempts to detect the language of the visitor's current page and displays the chat widget in that language. However, if you want to manually determine which language the widget appears in for different sites, you can do so using the API. The chat widget automatically detects a visitor's language and translates your chats accordingly. Using this feature, your support agents can communicate with visitors in other locales, even if they don't speak the language. 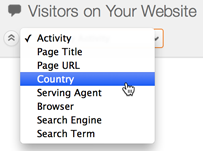 To get an overview of visitors to your site by locale, you can group the Visitor List by country. If you're working with a large number of agents, you can consider taking the following steps to help agents manage chats more easily. If you have a lot of agents or they specialize in different areas, you should use departments and the Pre-Chat form. This way, you can require visitors to select the department their questions are for so they are automatically routed to the appropriate group of agents. For example, you might want to have departments for Shipping, Finance, and Accounts. For more information, see Using the Pre-Chat form. If you have a lot of traffic, you might constantly receive new chat requests, making it hard for your agents wrap up their chats and be able to log out. To prevent this issue, you can set up operating hours, which automatically set the chat widget to invisible when your operating hours are over, even if agents are still logged in and finishing up their final chats. For details, see Creating a schedule with operating hours. All agents automatically receive offline messages unless it's turned on by default. You can ask your agents to turn off the feature of receiving offline message on their dashboard. You can help prevent spam by setting up triggers or by banning visitors. You might also want to restrict chats to countries you serve to reduce traffic. For more information, see Banning visitors. For high traffic dashboards, we recommend IE10, Chrome, or Firefox. If you're experiencing browser lag, it's likely due to memory issues or third party plugins. You can also improve dashboard performance by Using the High Load Dashboard.